Life in Crescendo: Why Eat Kimchi? 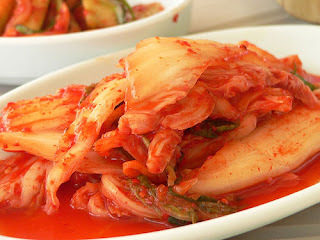 At last after two years I was able to taste kimchi again. But then my insides some sort of heated up. Since I experienced gastritis, my stomach overreacts the moment it accommodates what it considers foreign (oo, foreign ang kimchi!). But man, it tastes soooooo good! 2. it cleanses your intestines; it helps heal ulcers. 4. it helps lower blood cholesterol! It's an artery-purifier. 6. its ingredients contain high amount of fiber, vitamins A and C and iron. for additional facts, click this link.